No, you didn't imagine it. 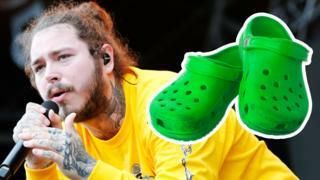 Post Malone was really advertising Crocs on his Instagram this week.The rapper teamed up with the divisive footwear company to create his own shoe. Even Madonna wanted in on the action, commenting on his Instagram post that she wanted a pair. Posty says he sold out in 10 minutes - but Crocs told Madge to DM them, so she's probably being sorted out with her own pair.It's not the first time a celebrity has seemingly gone against their personal brand to promote something weird you probably wouldn't link them to. Back in 2010, Keeping Up with the Kardashians was only three years old, and Kim was on her way to becoming one of the biggest celebrities on the planet.She wasn't too big to be turning down important endorsement deals though.Which is why eight years ago, we found her teaming up with a toilet roll brand to help open some public toilets in New York.They apparently offered a "highly engaging and interactive" experience.We're not sure how interactive the toilet experience should be - even if Kim is waiting outside to help you with loo roll. After appearing in ads for products such as Pepsi and Walkers, perhaps David Beckham felt he should go for something more healthy.Fresh from helping England beat Belarus in October 2008, the football star was at Wembley to promote some Findus fish fingers.Cue lots of awkward pictures of David with lots of kids, holding up fish fingers on forks.It hasn't harmed his reputation, though - Becks has more recently been seen in ads for whisky, aftershave and underwear. You know when some things are so bad they're good?Well, this isn't one of them.Budget brand Woolworths (?2 jeans!) got the martial arts master to feature in a bad sitcom parody with two sheep called Wooly and Worth.The advert goes downhill from there - a low point being where one of the sheep "mistakes" Jackie for Japanese-American actor Pat Morita.Soon after the advert aired in the UK, Woolworths went out of business and had to close all 200 of its shops. Too embarrassed to advertise weird things in your home country? Try doing it on the other side of the world.Maybe that's how Crisitano Ronaldo's agent sold it to him in 2014 when he appeared in a Japanese advert for... well, we're not 100% sure.The footballer was endorsing a rubber propeller-shaped device.You put it in your mouth - and nod up and down.And that's apparently meant to strengthen your face.It's safe to say it hasn't taken off over here.Follow Newsbeat on Instagram, Facebook and Twitter. Listen to Newsbeat live at 12:45 and 17:45 every weekday on BBC Radio 1 and 1Xtra - if you miss us you can listen back here.